Chi Hui-Jung is the CEO of the Garden of Hope Foundation, a Taiwanese foundation dedicated to preventing and decreasing sexual and domestic violence toward women and children, while aiming to provide a safe and friendly environment for survivors. She is also a well-known activist in Taiwan, who helped pioneer the establishment of laws in her country to prevent gender-based violence (i.e. Child and Youth Sexual Exploitation Prevention Act, Domestic Violence Prevention Act, Sexual Harassment Prevention Act), initiated plans to build shelters for domestic violence survivors, and founded the Formosan Daughter Awards to encourage girls to challenge gender stereotypes. Ms. Chi participated in the U.S. Department of State’s International Visitors Leadership Program (IVLP) in 1994, just two years after she had joined the Garden of Hope. Ms. Chi shared in the development of NGO leadership and management skills through her IVLP experience visiting many influential civil society groups and U.S. governmental agencies dealing with human rights issues. After returning to Taiwan, she applied the best practices that she saw in the U.S. to help the Garden of Hope grow to become one of the most influential NGOs in Taiwan. Two decades ago, when Ms. Chi entered the Foundation, it consisted of only a dozen staff members, one shelter room, and one tiny office area. At the very start, the Garden of Hope’s focus was primarily providing shelter services for sexual assault survivors. However, Ms. Chi felt more radical change was needed to improve the overall situation for survivors. She decided to combine policy advocacy and social services into the Foundation’s mission, initiating a series of public policy campaigns to push for the establishment of laws in relation to gender-based violence. In line with the broadening of its mission, she expanded the Foundation’s structure to include departments of public relations, research, educational activities, international affairs, advocacy, publications, and marketing. Today, the Garden of Hope has become a well-established non-governmental organization with a total of 13 branches in Taiwan and one in New York. It now has more than 450 staff members, over 550 active volunteers, and has provided assistance to hundreds of thousands of survivors of gender-based violence. Furthermore, Ms. Chi brought the Garden of Hope Foundation onto the international stage. The IVLP program was the main impetus for Ms. Chi’s realization of just how important internationalization is. She launched an English language version website to introduce the Foundation to international audiences, set up branch offices overseas to conduct exchanges among social workers, and has participated in United Nations forums, such as the UN Commission on the Status of Women’s NGOs conference and the UN Vienna Forum to Fight Human Trafficking under the UN Global Initiative to Fight Human Trafficking. In 2005, under Ms. Chi’s leadership, the Garden of Hope Foundation won the prestigious Citigroup #1 Asian NGO Excellence Award. 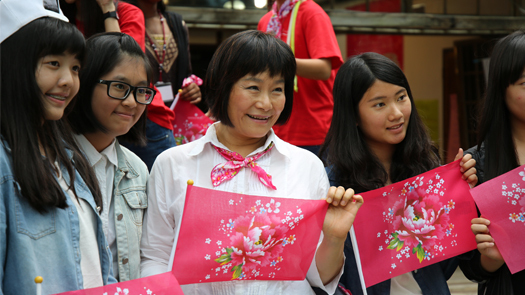 Ms. Chi and the Garden of Hope Foundation have worked with the American Institute in Taiwan and other exchange alumni for many years in organizing events like speaker programs, girls’ empowerment workshops and many community projects, for example helping minority women to join the labor market in Taiwan. Ms. Chi has inspired many other NGOs and social workers in Taiwan to develop innovative action plans to help underserved communities. Ms. Chi received the World of Children Award and the Kellogg's Child Development Award for her outstanding contribution to human rights—the first Taiwanese NGO leader ever to receive these prestigious awards. Today, Ms. Chi and the Garden of Hope Foundation are still expanding their efforts to cover more humanitarian issues: fighting against child prostitution and human trafficking, providing consultations to teenage mothers, and introducing global best practices on promoting women’s rights in Taiwan.